The human body constantly sheds cheek, or squamous epithelial, cells. Samples can be easily obtained by swabbing the inside of the mouth and are, therefore, often used in school laboratory settings. Scientists also frequently examine cheek cells since they contain human DNA and may hold clues that enable the early diagnosis of certain health conditions. Squamous epithelial cells divide about once in every 24-hour period and line the human mouth as part of the buccal muscosa. The cells secrete mucin, the substance that is the principal component of mucus. With the additional help of the salivary glands, the mucin keeps the mouth's interior moist. The mouth needs to maintain moisture in order to help secreted enzymes soften food, facilitate swallowing and begin the digestion process. 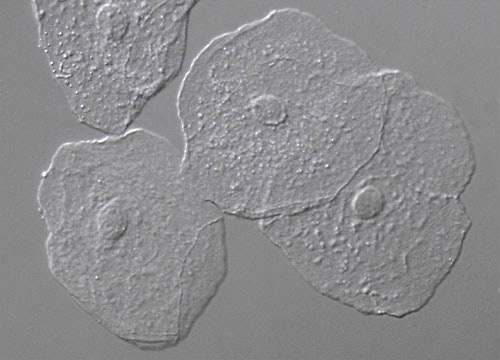 The nucleus of each tiny cheek cell holds the genetic make-up of the entire body. 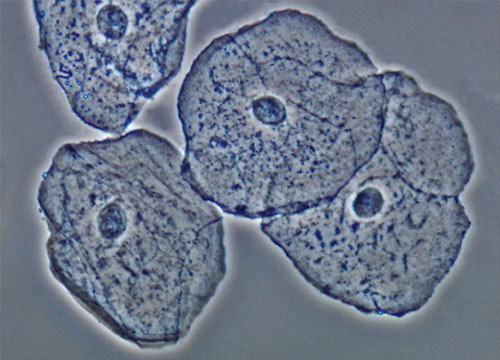 Consequently, cheek cells are frequently used in diagnostic tests, such as paternity determination, and DNA fingerprinting efforts. A group of scientists in Australia, however, have found a new use for cheek cells. The researchers are examining the sodium transport level of squamous epithelial cells in children to determine whether or not they have a predisposition for developing hypertension. If their studies and testing procedures prove successful, those with a greater proclivity may receive early warning and will be able to take preventative measures to avoid the condition.